The PPA Secretariat is the focal point of the Pacific Power Association which coordinates the activities of the Association. The Secretariat represents the Members of the Association at energy fora, assists the Members with requests and works with development partners and regional and international organizations in the development of electricity utilities in the Pacific Islands. Requests for assistance from development partners, international and regional organizations, or from interested governments are generally channeled through the PPA Secretariat. 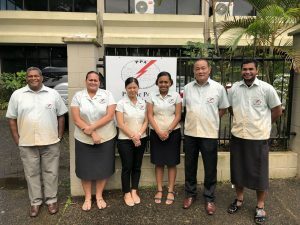 The Secretariat is headed by the Executive Director and is located on the Ground Floor of Naibati House, Goodenough Street, in Suva, Fiji Islands.